Railpictures.ca - Doug Lawson Photo: MK 5001 on BC Rail at the Prince George loco shops. It was rather illusive for getting a photo. This GP9 rebuilt by Morrison Knudsen, upgraded electrically as well as equipped with a 6 cylinder Sulzer marine diesel motor. I can’t recall if BC Rail had it for evaluation / testing or just for filling in during a locomotive shortage. | Railpictures.ca – Canadian Railway Photography – photographie ferroviaire Canadienne. 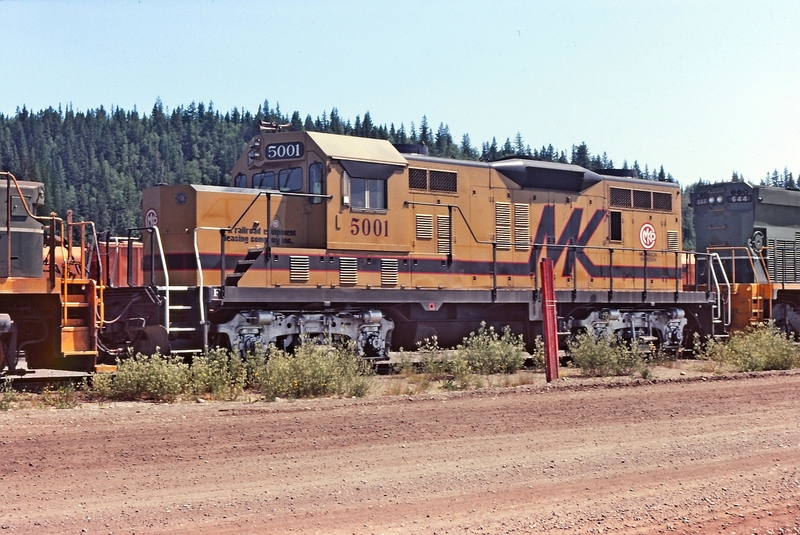 Caption: MK 5001 on BC Rail at the Prince George loco shops. It was rather illusive for getting a photo. This GP9 rebuilt by Morrison Knudsen, upgraded electrically as well as equipped with a 6 cylinder Sulzer marine diesel motor. I can't recall if BC Rail had it for evaluation / testing or just for filling in during a locomotive shortage. This demo unit, model MK TE50-4S (rebuilt from an ex-UP GP9) also did time demoing on CP in 1980.